The latest Kohls Coupon codes Christmas 2016! Don’t forget that Kohl’s accepts up to two codes per transaction, one category or free shipping code & one sitewide code so make sure you attempt to stack two coupons. COLORS – This coupon code will get you 20% off your entire order, plus $10 in Kohls cash for every $50 spent. Click Here To Use This Code. Harvest – Use this code to receive 15% off and free shipping on any order over $75. Click Here To Use This Code. CATCH15OFF – Get 20% off your order on Kohls.com using this coupon code. Click Here To Use This Code. Thanks for checking out the latest updates on KohlsCoupons.com and make sure to find us on facebook! This entry was posted in All Coupons on January 19, 2014 by admin. The latest Kohls Christmas Coupon codes for the month of December, 2013. RUDOLPH20 – This Kohls coupon code entitles you to 20% off your order over $100, plus free shipping, AND $10 in Kohls cash for every $50 spent. Merry Christmas! Expires December 24th. Click Here To Use This Code. HOLIDAY – Receive 15% off any order, no minimums. This is a great code to use for smaller orders. You still receive free shipping over $50. Expires December 24th. Click Here To Use This Code. RMN20 – Use this code to receive 20% off your order, no minimums and no Kohls card required! Free shipping on orders of $50 or more. Expires December 9th. Click Here To Use This Code. RMN25 – Use this code to receive 25% off your orders of $100 or more! Free shipping is included and receive $10 in Kohls cash for every $50 spent. Expires December 9th. Click Here To Use This Code. This entry was posted in All Coupons on December 9, 2013 by admin. The latest Kohls Christmas Coupon codes for the month of November, 2013. BLACKFRI – This is a great Black Friday code just released. Receive 15% off your order, plus receive free shipping over $50, PLUS receive $15 in Kohls cash for every $50 you spend. This coupon expires December 1st. Click Here To Use This Code.SHOPEARN – When you use this coupon code, you’ll save 15% off your order with no minimums. Also receive free shipping over $50. Expires November 27th. Click Here To Use This Code. RMN15OFF – If you’re spending over $100 and there aren’t any 20% coupons available, use this coupon for 15% off and free shipping. Expires November 30th. Click Here To Use This Code. FFNOVM20 – Save 20% off all online orders when using this code! Also receive free shipping over $50. Expires November 24th. Click Here To Use This Code. APPLE20 – If you have a Kohls Card, use this code to receive 20% off your online order. Combine with code: FREESHIPNOV to receive free shipping with no minimum. Expires November 16th. Click Here To Use This Code. TWENTY4U – Order over $75, and receive 20% off plus free shipping. This matches the best discount usually seen for non-kohls cardholders. Expires November 7th. Click Here To Use This Code. This entry was posted in All Coupons on November 6, 2013 by admin. The latest Kohls Coupon codes for the month of October, 2013. CARAMEL – Online Kohls shoppers can use this code to receive 20% off orders of $100+, including free shipping. Expires October 27th. Click Here To Use This Code. APPLE – If you’re not spending over $100, use this code to receive 15% off your order with no minimum. If you end up spending over $75, you’ll also receive free shipping. Expires October 27th. Click Here To Use This Code. CANDYCORN – If you have a Kohls credit card, use this code to receive 20% off your order with no minimums. Shipping is free. Expires October 27th. Click Here To Use This Code. RMN15OFF – If you’re spending over $100, using this coupon will get you 15% off and free shipping. Expires October 31st. Click Here To Use This Code. LUCKY15 – This code will give you 15% off with no minimum order. Your order will ship free when the total is over $75. Expires October 31st. Click Here To Use This Code. October20 – For those without a Kohls card, this will probably be the best code you’ll find to do your Christmas shopping. Receive 20% off your order + $10 in Kohls cash for every $50 spent + Free shipping over $75. Expires October 16th. Don’t miss out! Click Here To Use This Code. HARVEST15 – This code will give you 15% off with no minimum order. Your order will ship free when the total is over $75. Expires October 14th. Click Here To Use This Code. FREE2U – If you’re order is over $50, but under $75, try to stack this coupon code with one of the other discount codes to see if you can still score free shipping. Expires October 6th Click Here To Use This Code. This entry was posted in All Coupons on October 13, 2013 by admin. 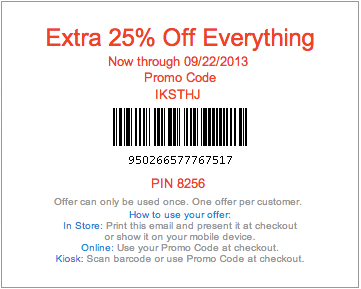 The latest Kohls Coupon codes for the month of September, 2013. PUMPKIN – This code will give you 15% off with no minimum order. Stack this coupon with code SHOP2SHIP50 if you’re spending over $50 to receive free shipping as well. Expires September 29th. Click Here To Use This Code. 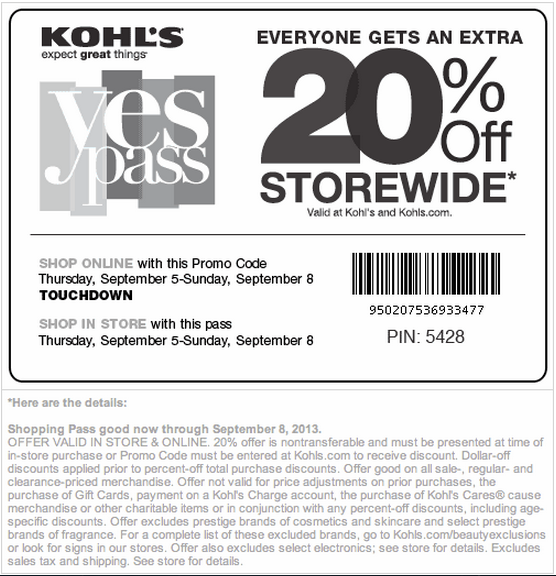 FALLSTYLE20 – For those with a Kohls card, you can use this code to receive 20% off your order. You’ll also receive $10 in Kohls cash for every $50 spent that can be used between October 6th through the 17th. If you’re a MVC (most valuable customer) stack this coupon with code SHIPFREE4U to receive free shipping as well. Expires October 5th. Click Here To Use This Code. CLICK HERE FOR PRINTABLE IN-STORE COUPON – Print this coupon to receive 15% off your in-store purchases. This coupon expires on October 5th. RMN15OFF – If you’re spending over $100, use this coupon code instead. This code will give you 15% off and free shipping. Expires October 31st. Click Here To Use This Code. SEPTSAVE20 – If you have a Kohls credit card, receive 20% off on any order, no minimum. You’ll also receive $10 in Kohls cash for every $50 spent, which can be used between September 19th and September 29th. If you’re a “Most Valuable Customer,” you can also receive free shipping with coupon code “WESHIPFREE”. This expires on September 18th. Click Here To Use This Code. IKSTHJ Use coupon code IKSTHJ to get 25% off anything. It DOES NOT require a Kohls charge card so it can be used with any form of payment. Code stacks with MENSTYLE15 or BABY10 for additional savings. Expires on September 22nd. Click Here To Use This Code. WELUVU20 Use this Friends & Family coupon code to get 20% off your order. No minimum required but spend $75+ and receive free shipping! Expires September 22nd. Click Here To Use This Code. CLICK HERE FOR PRINTABLE IN-STORE COUPON – Take this with you into any Kohls store and receive 25% off your in-store purchase. This coupon expires on September 22nd. BDAY20 – 20% off on orders over $100, plus free shipping on orders over $75. If you don’t meet the $100 order limit, you can still use the coupon for free shipping. This expires on September 18th. Click Here To Use This Code. ITSRBDAY – 15% off any order, NO MINIMUM! If your order is over $75, you’ll also receive free shipping. This expires on September 18th. Click Here To Use This Code. CLICK HERE FOR PRINTABLE IN-STORE COUPON – Receive 15% off your in-store orders, or save $100 when you spend $100 or more with this printable coupon. This coupon expires on September 18th. TOUCHDOWN – 20% off everything plus free shipping on orders over $75. This expires on September 9th. Click Here To Use This Code. 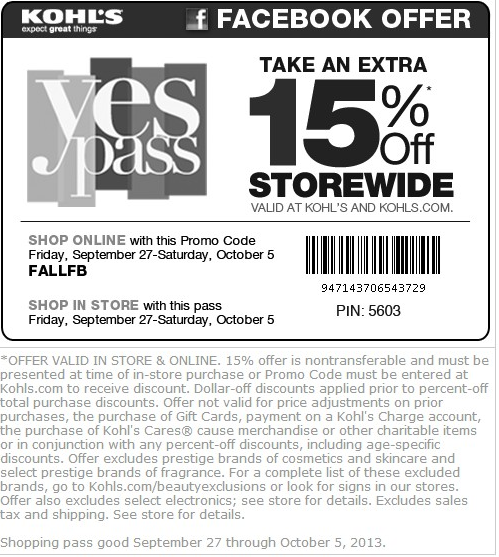 YOURDAYB – If you have a Kohls Card, use this code to receive 15% off your order. Expires September 10th. Click Here To Use This Code. CLICK HERE FOR PRINTABLE IN-STORE COUPON – If you’ll be shopping in-store, you can use this coupon for 20% off until it expires on September 8th. This entry was posted in All Coupons on September 23, 2013 by admin. AUGUSTGIFT – 20% off everything plus free shipping on orders over $75. This expires on August 8th. Click Here To Use This Code. SUNSHINE15 – If you have a Kohls card and miss the friends and family sale, go ahead and jump on this 15% off sale. It’s pretty standard for Kohls cardholders. Free shipping over $75. This expires on August 8th. Click Here To Use This Code. SAVEVS3 – If you’re spending over $75 and no other codes are currently available, this code will give you 10% off and free shipping. It isn’t ideal, but it is around for a while. Expires 10/31/2013. Click Here To Use This Code. RMN15OFF – If you’re spending over $100, use this coupon code instead. This code will give you 15% off and free shipping. Expiration date is unknown. Click Here To Use This Code. FAMILY20 – Friends and family sale! This is always one of the best deals of the year, but it expires at midnight, August 4th so you’ll need to hurry. This coupon gives you 20% off every order, plus free shipping (no minimum required). As an added bonus you can receive $10 in Kohls cash for every $50 you spend online. Click Here To Use This Code. As we move closer to the holidays, we’ll be bringing you updates more often so make sure you check back often. We should be seeing some exciting end of summer sales coming up soon! This entry was posted in All Coupons on August 2, 2013 by joshmv. These are the Kohls coupon codes for the first week of July, 2013. RMN15OFF – 15% off $100 sitewide & Free shipping over $75. As always we’ll keep these updated for you and new codes will be posted in a few days. Thanks for checking KohlsCoupons.com! This entry was posted in All Coupons on July 2, 2013 by joshmv. We’re in the process of simplifying Kohls Coupons so please forgive our unusually empty site. Our goal is to cut out the clutter, and give you a simpler way to see the latest coupon codes as well as links to printable coupons. We appreciate your feedback and please feel free to share our updated posts with friends. This entry was posted in All Coupons on June 19, 2013 by admin. Kohls Coupons is striving to become the #1 source for up-to-date coupons for Kohl's® Department Stores. I'm a shopper myself so finding the coupons every day is definitely a labor of love. If you have any questions or suggestions please feel free to use our contact page to get a hold of me!